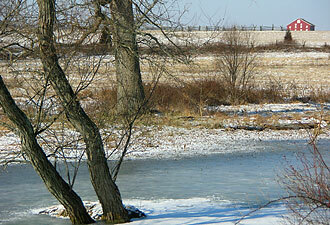 NPS.gov homepage photo: The Gettysburg Cyclorama painting brings Pickett's Charge to life. The scale of Gettysburg, a national park in south-central Pennsylvania, is immense: 6,000 acres; 1,320 monuments; 400 cannon; the Soldiers' National Cemetery with 7,000 interments; one million artifacts and archival documents. But Gettysburg is so much more than numbers. It's an American shrine — a pilgrimage destination for a million visitors each year who explore the site of this massive Civil War battle and the place where President Abraham Lincoln outlined the future of the nation in his Gettysburg Address. A winter walk around the fields here offers a terrific opportunity to study the topography of this famous battleground, as well as time for quiet reflection. There is ample food for thought in the fact that this year marks the beginning of the 150th anniversary of the Civil War. Gettysburg, site of a turning point in that conflict, provides an excellent portal from which to embark on a discovery of this chapter in our nation's history. The National Park Service is excited to help everyone learn more about the many dimensions of the war — social, political, cultural, and, of course, military. The Battle of Gettysburg — the bloodiest encounter of the Civil War — represents a pivotal moment when the fate of America's “experiment in democracy” hung in the balance. The “what if?” scenarios alone at Gettysburg make for endless fascination. Equally engaging is the park's new museum, which showcases one of the most extensive Civil War collections in the nation. 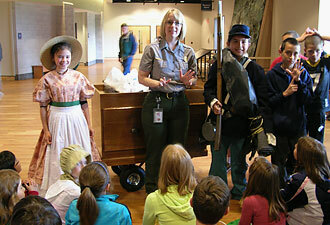 Artifacts, films, and hands-on exhibits immerse visitors in the Battle of Gettysburg and the Civil War. Don't miss the Cyclorama painting, a huge historic canvas that brings Pickett's Charge to life. It was the IMAX of its day back in the 1880s. Out on the fields, newly built fences, replanted orchards, and long-lost meadows and farm lanes that have been reestablished help visitors see the battlefield the way soldiers did at the time of the fighting in July 1863. No visit to Gettysburg would be complete without a trip into town to understand the battle's aftermath. The David Wills House is a new National Park Service museum right on the square in downtown Gettysburg that tells the story of what followed the battle, including Lincoln's visit to give the Gettysburg Address. Gettysburg can take you beyond the Civil War — almost a century beyond it — if you hop one of the shuttle buses that carries visitors from the Gettysburg National Military Park Visitor Center and Museum to Eisenhower National Historic Site, the home and farm of President Dwight D. Eisenhower. Here you can tour Ike and Mamie's house, and kids can become Junior Secret Service Agents. 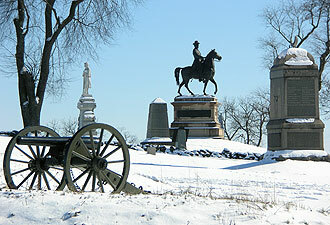 Do be aware that in winter, weather occasionally causes the closure of some roads and buildings in Gettysburg National Military Park. Take a look at some other Gettysburg provisos, and start planning your visit.